Once again Vonnegut throws up his hands at the human race, condemning it for its overweening technology, war-making, greed and other perversities. And yet, underneath, he still seems to like people, so his solution in this quasi-science-fiction novel is to "evolve" humanity for another million years until it becomes unift for mischief--in fact, fit for little else but catching fish. In this prickly and only occasionally funny ramble, that represents progress. The narrator is a ghost in this death-haunted tale, a disillusioned Vietnam vet who happens to be the son of Vonnegut's Kilgore Trout. He watches as an odd lot of damaged people assemble in 1986 in an Ecuadorean port to join "the nature cruise of the century" to Galapagos, volcanic islands made famous by Darwin's visit. The world is in the throes of an economic crisis, Ecuadoreans are starving, war and all hell break out--and the little band of misfits, reduced in number but augmented by some cannibal girls, set out to sea for refuge. It is they who become the ancestors of the future human race because the rest of the world becomes sterile and dies out. Vonnegut has his followers who like big issues treated in so jaunty a fashion. His voice is good, clear middle. American, and he doesn't beat about the bush. One of his devices is to put an asterisk by the name of a character who is about to die. There is a subtext to this story: an attempt to deal with disease and death by mocking them. 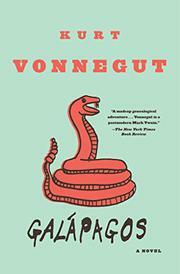 Vonnegut is whistling in the dark, and it's a thin, jumpy little tune despite his feats of imagination. But his dark is real enough.